No science fiction trick, this car is powered by a miniature version of the same type of fuel cell now being tested in full size cars by eight of the world’s major auto manufacturers! Carefully designed to allow students to perform standard curriculum experiments in Physics and Chemistry as well as to investigate the important emerging technology of fuel cells, the Complete Set comes with everything except water and a lamp, and includes a full set of four course books. The heart of the system is a reversible fuel cell using a Proton Exchange Membrane (a PEM fuel cell). The cell generates hydrogen and oxygen by electrolysis then consumes the gasses to drive the wheels. Shining sunlight or a spotlight onto a solar cell produces electricity for the electrolysis process. The four course books include a comprehensive set of Research Notes and each of the other three books contains twelve prepared lesson sessions oriented to Physical Science, Chemistry, and Physics respectively. Topics are correlated to national standards. The Complete Set contains the Hyco car and fuel cell, a solar cell module, a measuring box, connecting cables. 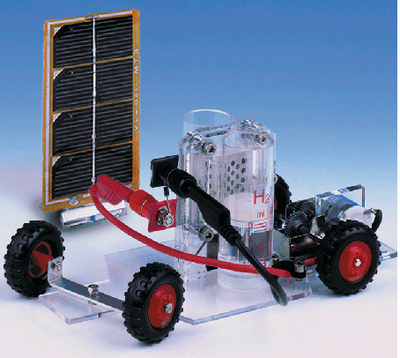 Also available is a Demonstration Set including only the Hyco Car (with instructions) and the solar cell module. You need to supply distilled water and sunlight (or a 90W spotlight).